1. Open up the Arma editor from the single player menu (disable the DayZ mod (remove -mod=@DayZ) if single player is greyed out and can't be selected)). 3. Now highlight Markers to the right select menu. 4. Using the map marker, find a spawn position close to the centre of the map and double left click on the mouse. 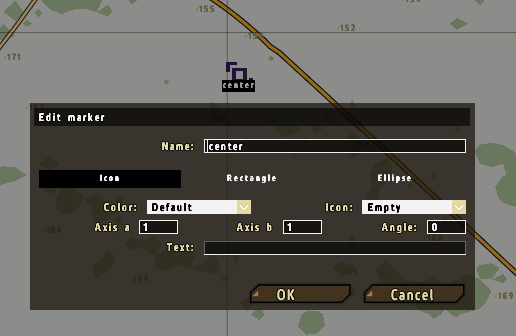 Type under name 'centre', leave everything else as it is, and select OK.
6. Now select 'Save' and name it 'spawnpoints', save as 'user mission. Find the same section of code as above and replace each position coordinate, i.e. take the centerwest position number from your own created mission.sqm you made in the editor and paste it into the position in the dayz mission file. Also if you followed the sequence as above, it should be identical (apart from having both different and new positions), so you may be able to just copy and paste the whole class. Just make sure the code syntax is copied over correctly. Back up your DayZ mission.sqm first, so you can rollback if you screw it up. Could this method be used to create vehicle spawn points as well? It could, but I have a much better method. I will try and post it up soon. That would be great. If you could write something up on how to do a map conversion for dayz that would be great too. I have been plying around and figured out some of it but never quite got one working. I'd love to find out how to do it then maybe start making a map of my own from scratch. I need to clean up a lot of loose ends from Celle first, but after that hopefully I can chill and put up some material. That'd be awesome. But any chance of just a quick list of things I could look up myself for now? I'm making a map for arma2 and can't find anything about what I need to do to convert it for use with DayZ. Theres a few things you need to do, but the main points that should get you up and running. Next you want to download a server install and set it up inside a COPY of your arma 2 OA folder (there are plenty of tutorials around to show that) - call the folder something like MyServer (anything will do). Note the above is an example, it depends on the server (that example is using pwnoz0rs build). After that you want to make sure you have @zombiesmap and @dayz in both the root of your server and the Arma 2 OA installation folder. That should be enough to get you up and running with your map and the DayZ mission running. If you use the same buildings as Chernarus then you will get loot and zombies spawn, if not, and you are using new buildings it gets a little more complicated, but I will go into that soon. That's excellent thanks a lot for taking the time to do that. No worries, I have a load to do this weekend, but after that I will right up some more. Going to make a video tutorial series on this. Thanks for the info Shinkicker. However, I am having an issue getting this [spawn locations] to work. After doing what is stated in your first post. I rebuilt my pbo. and booted up my server. The spawnpoints still appear to be as they were before - as in I'm not spawning at my new locations. I have checked my MPmission pbo and it shows the spawns I created, but they don't seem to have any effect. Follow the same procedure as the post with the screenshots, but put your markets right up north near the edge of the map and re'PBO them back up. Now restart the server, kill y'self and then see if you respawn in the north. What you could also do is upload your PBO to mediafire or a similar service and I can take a look at it later ron. EDIT: One other things come to mind, if you mission is PBO'ed that suggests its the Bliss build? I wonder if ayan has changned the spawn function and put it somewhere else? Hmmmm...I will see if I can check that out if thats the case. Thanks for your reply. Sorry I forget to mention (half asleep when I wrote the post) it is the Bliss build I'm using. The first trial was on Utes map, and it seemed to have no effect. After your post, I have retried using Chernarus map, I placed the markers up north as you suggested. This time I always spawn inside that house in Novy. - The one that very rarely happens with the regular spawns. - No matter how many times I kill myself or where I move my spawns to, this is the only spawn that seems to be active. @shinkicker, what if the map is using different objects, lets say from panthera, what's the procedure then? This is the exact same thing that happens on my server when I try to adjust the player spawn points. the fact that each marker reprecenta a class. Items spawning, or spawning zombie ..
_isNear    = count (_position nearEntities ["Man", 50]) == 0; // Another player near? I am trying to add a few extra spawns as well. I get the same problem as above where a new player may get the spawn but a dead player re spawning gets stuck in the house in novy sobor. I have added the new locations via the mission file and edited the random selection in dayz_server.pbo => compile => server_playerSetup.sqf to no avail.